I'm kind of on a basement kick, eh? I'm not sure I've ever shared our laundry room on the blog before....well, here it is. WHY? But the real winner of this space was the horror-show floor. It looked like some black rubber mats were thrown over a crime scene. The red paint under those mats was still WET. We got the mats up, let the room dry out, then took some scrapers and got to work on all the loose and flaking paint on this floor. There was green, red, gray, tan, every shade. 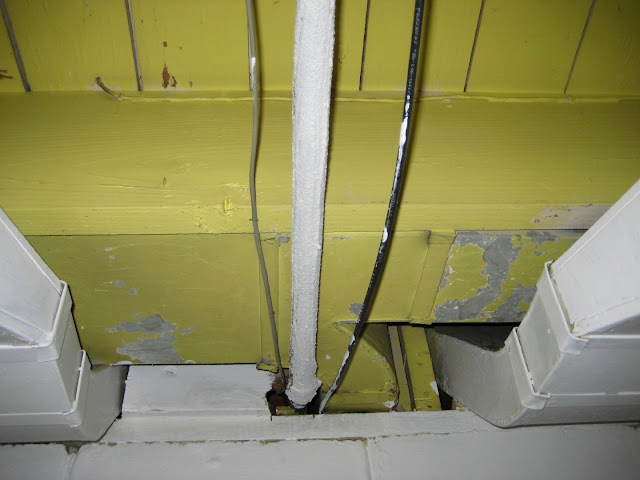 After painting the cinderblock walls white and the paneling aqua, we scraped all the yellow paint off the joists and ruined our necks in the process. Then we scraped and sanded the floor until we felt comfy going over the it again with Behr Epoxy floor paint in Spanish Parador. This all happened in 2008, right before we got our new piece of crap washer and dryer. And here is what it looks like after a couple coats of Rustoleum Oil Base White paint. That stuff is MAGIC! 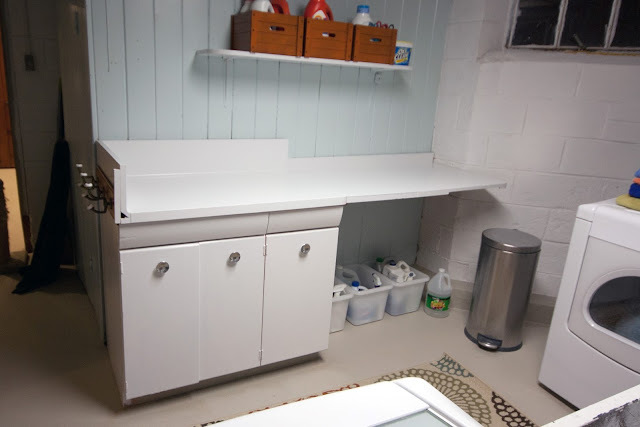 I'd used it before with great results on our IKEA desk, and had great results again. Yes, it is still sticky and stanky. 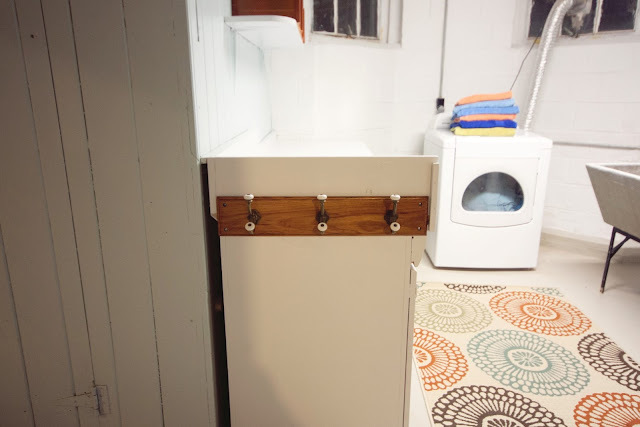 To cover the break where the old metal cabinets and the awkward countertop meet, I hung up this old bathroom hook thingy that my mom gave me years ago. It was free, and fits perfectly! Plus, it's great for hanging stuff to dry. Mostly bras. Yep, it's pretty much a bra drying rack. I spent $45 on a new indoor outdoor rug from Overstock that looked pretty and happy, and I'm extremely glad I did. It doesn't seem outdoor like, or plastic. It is so nice! I also made some little curtains for the gross windows using leftover fabric from upstairs projects, dowels and dowel caps from Hobby Lobby. The entire project cost me $3 and really makes a difference. Here is the finished laundry room today! I am so proud that I was able to make it look like this with some paint, some elbow grease, some cheap fabric, and a new rug. We can't all have beautiful new cabinetry, tile, windows, etc...but even a crappy space like ours can look cute! I'm all about making the best of what I've got these days, so this project makes me feel good. Now if only I could devise a way to have other people do my laundry for me. 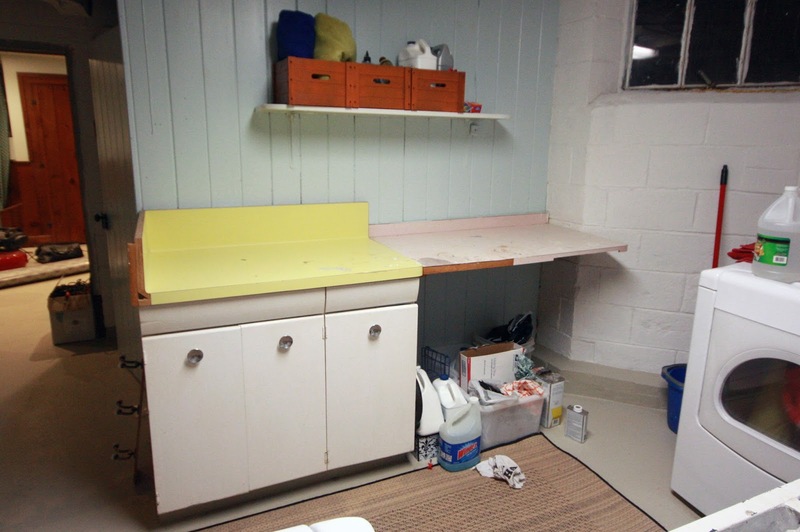 PS - turns out I did share the 'old' laundry room before, back when I was much funnier at the start of my blogging journey, read it here! I love seeing how my description of the room changed from then til now. Ah, 2009 me...you were awesome. Wow! What an amazing change. 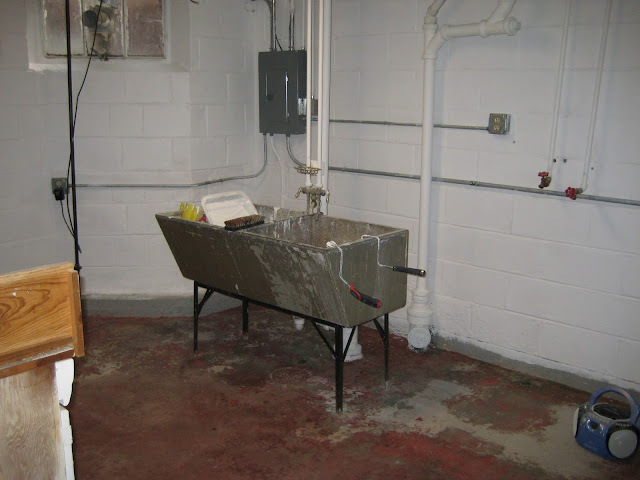 We have an unfinished scary basement where our washer nod dryer live....no redo will help ours. This looks great. I really need to try putting up curtains in our basement, too. Great idea. Haha, I miss my 2009 self too. So rested, so not encrusted with fruit snacks & mac & cheese, so able to finish sentences whilst conversing w/ others, so sure I had brushed my teeth that morning. Holy transformation batman!! I'd gladly do my laundry AND your laundry in the new space!! 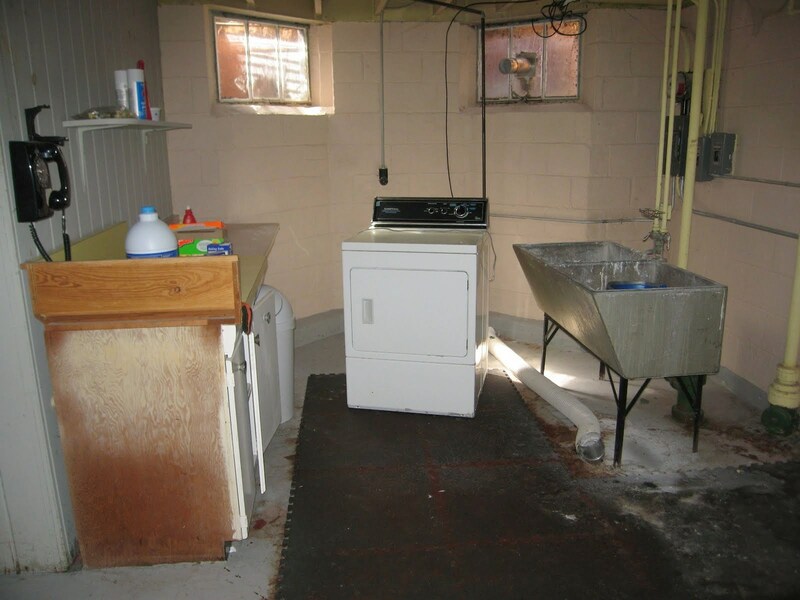 I think it looks great - I just went through and deep cleaned my laundry room (in anticipation for getting a new washer delivered - I didn't want the Loew's dude to see how horrible it was. Now that it's clean I enjoy laundry slightly more than not at all. So that's progress right? ** I also added a happy rug - I think it makes all the difference.